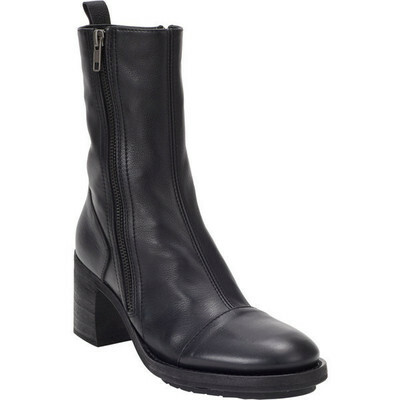 Ann Demulemeester black grained leather ankle boots styled with exposed zippers along shaft sides. 2.75" (70mm) heel, approximately. Smooth leather cap toe, pull tab at topline, curved stacked leather chunky heel, tonal topstitching, stitched welt Zips at side. Rubber lug and leather sole. Available in Black. Made in Italy.